The houses turned out really cute! I think it's a great idea to use the graham crackers. So cute! Wish I'd have thought of graham crackers! And I had to laugh reading your post because I just posted my gingerbread house one and was gonna share that SAME book! lol - so I put a link to your blog for my readers to come check it out! Gingerbread Baby is a great book! 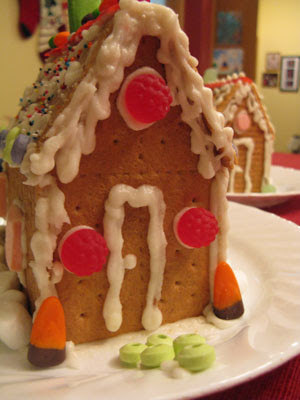 We have always used a kit to make our gingerbread house. 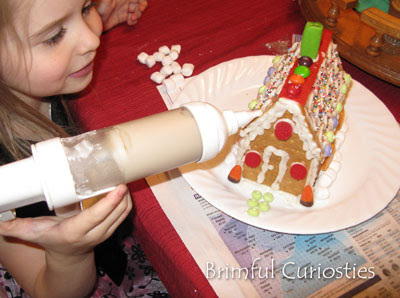 I love the idea of making our own gingerbread, but it seems like a lot of work when my kids won't eat the gingerbread. I don't know, maybe someday. Anyway, I love your graham cracker houses!!! Wow, do these look yummy! We get to make our gingerbread home at our mom's group this week. 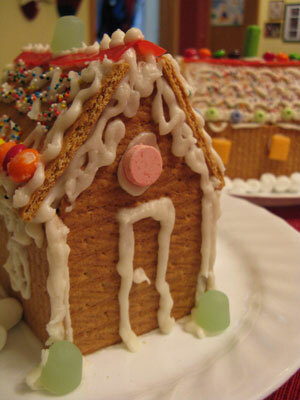 Cute gingerbread houses! We haven't read Gingerbread Baby yet, but I keep hearing it's good! The kids did a great job on their gingerbread houses. Yummy looking! 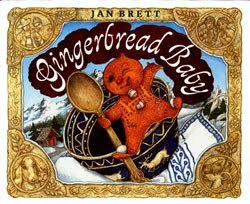 I haven't read Gingerbread Baby yet, but I have enjoyed reading some of Jan Brett's other books. Yes, your no recipe thing drives your friends crazy :) We've been reading Gingerbread Baby daily at our house! P.S. I'm impressed that you have a frosting decorating gun. But, then, you also saved me with the Bundt pan today. Thanks! 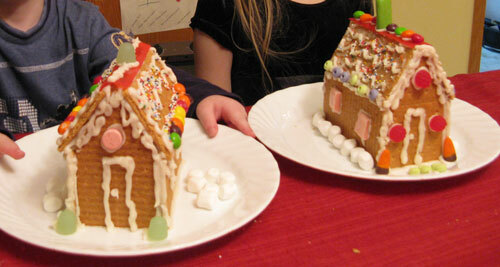 The gingerbread houses turned out wonderfully.